Faculty can use Lynda.com for professional development or to complement a classroom presentation. Below you can learn more about UNT’s LyndaCampus or just visit LyndaCampus now. After a long semester, you may want to rest, but when your focus turns to new-semester planning, think of Lynda! Lynda.com – a powerful tool in the classroom! 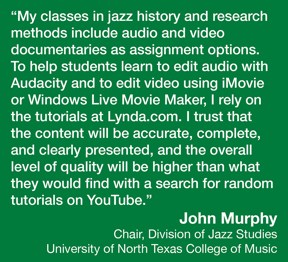 Using UNT’s LyndaCampus subscription, you can supplement your teaching and allow students to explore concepts at their own pace. Lynda.com integrates seamlessly with Blackboard Learn, UNT’s learning management system. Owned by LinkedIn, which is owned by Microsoft, Lynda.com provides more than 12,000 courses to choose from, and you'll never run out of high-quality, up-to-date training material to supplement your classroom curriculum. Adding Lynda.com content to Blackboard Learn. You and your students also can use the knowledge checks and Lynda.com's built-in note-taking tool to practice what they have learned and remember ideas for your own teaching practice. LyndaCampus courses are available to you now for inclusion in your fall classes and syllabi. Since UNT students can access what you assign from within Blackboard Learn, faculty are encouraged to incorporate these materials into their online courses. For more information, visit CLEAR’s Blackboard support page. For more information and to access LyndaCampus for UNT, visit UNT LyndaCampus. Access to Lynda.com simply requires clicking on the green button labeled "Lynda.com Sign In" and entering a valid UNT EUID and password for access. Previous users of Lynda.com can import prior usage history into a UNT profile by following the setup instructions for a computer or mobile devices. Technical issues with LyndaCampus should be directed to the UIT Help Desk.